Yasmeen admitted that while she did not give too much thought to the issue when she was young, it struck her anew when, during an outing with her husband Zuber, a mosque located nearby did not allow her to go inside and offer namaz. 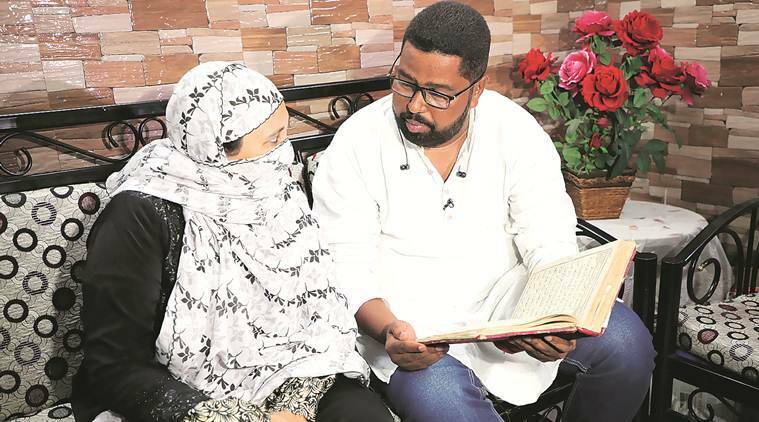 The family members of Zuber and Yasmeen Peerzaade had no idea that the married couple, based in Pune, had filed an appeal seeking directions to let Muslim women enter mosques and offer prayers. They got to know about the appeal only after the Supreme Court admitted it on Tuesday, and the Peerzaades informed them. “My mother, elder and younger brothers, as well as their families, are away at Kudachi village in Karnataka’s Raybag. We did not inform them earlier as we were not too sure of their reaction, but I have just spoken to my elder brother Altaf and he is okay with it,” said Zuber (48). Based on the couple’s appeal, the apex court on Tuesday issued notices to the Centre, the All India Muslim Personal Law Board and the Central Waqf Council, and directed them to file their replies within four weeks. “We are grateful that the SC has admitted our plea,” said Zuber, who has a construction business. Yasmeen, 42, is a housewife and the couple have two sons. Yasmeen admitted that while she did not give too much thought to the issue when she was young, it struck her anew when, during an outing with her husband Zuber, a mosque located nearby did not allow her to go inside and offer namaz. “The incident took place a couple of years ago… in Aundh gaon. There was a mosque nearby and since it was time for prayers, Zuber went inside to offer namaz. When I followed suit, authorities refused to allow me and also chided me, saying was I not aware that women are not allowed inside the mosque. It hurt me… and I started thinking… why can’t women go inside a mosque and pray…,” said Yasmeen. She further wondered, “Jab mana kiya hai to kya hamare liye Islam mein jagah hai ya nahi (If we are being told no, does that mean there is no place for us in Islam).” Yasmeen said the incident made Zuber and her want to find out more about the issue. Rajendra Anbhule , the petitioners’ lawyer, said Zuber had been working on the issue for months. At Pathan chawl in Bopodi, where the couple lives, people from nearby slums greet him. “They are not aware of the matter,” Zuber said, in between giving interviews to some TV channels. He also runs a charitable trust that offers food to the underprivileged. “My father was a driver at the ammunition factory at Khadki… after his death, my brother got a job there. I have seen rough times… when we were not financially stable. I got a job only after the Valmiki Ambedkar Awas Yojana was implemented. Under the scheme, slum dwellers were being given Rs 50,000 to make pucca houses, and I got a job providing raw material for the construction. I learnt the trade soon and got involved in the construction business. Today, I am stable financially and I have set up the Noor Charitable Trust, which runs a roti bank. We do not take donations, but invite people, hoteliers and others to deposit food, rice or chapatis,” said Zuber. He said he was not worried about the backlash to the petition, as they both felt that it was the right thing to do. “So far, no one has objected to our decision and we will try to raise awareness about the issue,” added Zuber.